I haven’t done much ruler work with my Sweet Sixteen, with the exception of straight line work (e.g. stitch in the ditch) using the Line Tamer ruler from Four Paws Quilting. I love this ruler as it has channels to hold the hopping foot in place and so there’s very little that can go wrong — for example, it’s not easy to wander off line if you use it correctly. However, I initially had a few trials and errors in using it, so this short tutorial shows you how I use it and what to watch for so that you can keep your stitching lines nice and straight. PLEASE NOTE: This ruler is NOT for use with domestic sewing machines — it is made specifically for mid-arm and long-arm quilting machines and it comes in two sizes, depending on the machine you have. The ruler is 10.5 inches long, with vertical lines laser-etched into the plastic every 0.5 inches. There are two horizontal lines — the top one near the opening is 1.5 inches down from the top, and the bottom one is 1.75 inches from the base of the ruler. On my ruler (suitable for the HQ Sweet Sixteen hopping foot), the half-inch lines near the inner edge of the slot are in effect 0.25 inch vertical lines. There are also some 45 degree lines. or some other angle of your choosing. NOTE: If you are using the open-toe hopping foot, be careful if you’re trying to use the ruler at any angle other than vertical — the sides of the hopping foot need to touch the edges of the slot, and at non-vertical angles, that can be an issue. I tend to use the ruler vertically, and slide the slot around the foot so that the open part of the slot is furthest away from me. I then pull the ruler (and quilt) towards me. But that’s me — you’ll need to practice to find out the best position for you. 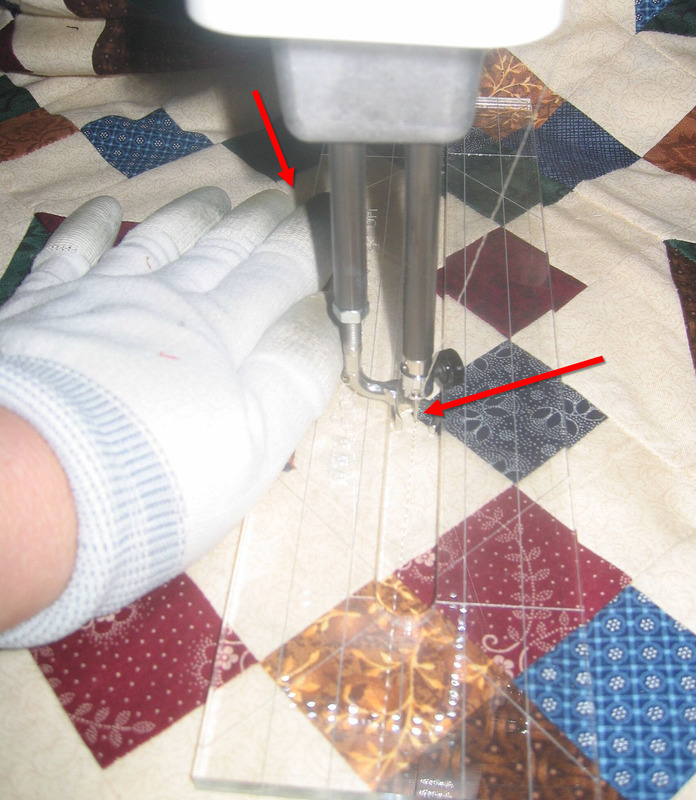 I also use Machingers quilting gloves when using the ruler as it gives me better grip. In the photo below, you can only see my left hand as I used my right to take the picture! But I’d normally have both hands on the ruler, applying downward pressure with the heels of my hands, thumbs, and forefingers as I move the quilt and ruler towards or away from me. Notice that my third finger (left red arrow) is resting against the edge of the ruler. I do the same with my right third finger, and in this way I can adjust the position of the ruler as smidge if I need to as I’m stitching just by moving those fingers to the left/right as required. I think of this finger control like a horse’s bridle — with a well-trained horse, you only have to adjust the bridle a tad to the left or right to make the horse go where you want it to go. Or, if you’re not familiar with horses, think of power steering in your car — you only need to touch it a tiny amount to make small changes in direction. In the example below, I’d use my right finger to make a tiny leftward adjustment to the ruler so that I didn’t stitch over that point (right red arrow). Actually, I’d normally have made that adjustment a few stitches back. NOTE: In this photo I’m using light coloured thread, so I’d make any adjustments in direction in the light areas of fabric, not in the dark areas where they’d be noticeable. 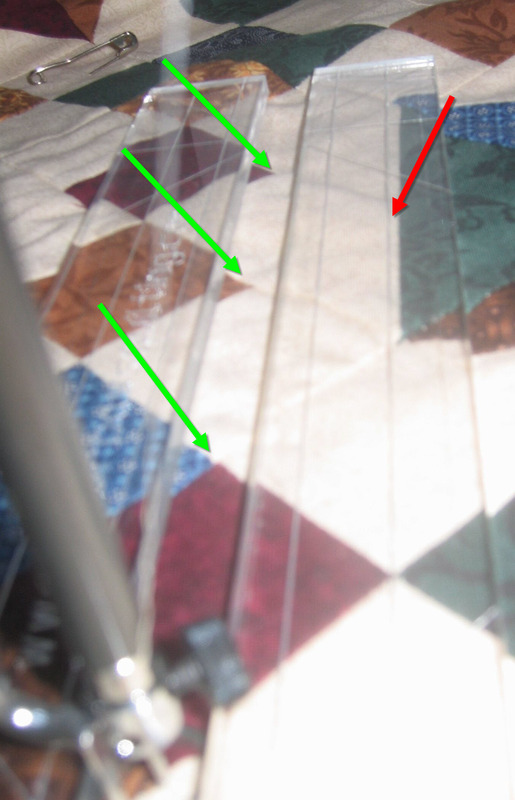 In the picture below, you can see how I’ve lined up the ruler — the green arrows show the alignment of the centre line with the previous stitching and how the stitches just touch/skim the dark fabric points. The red arrows show another alignment method — placing the laser-etched lines parallel or on the seam lines. Of course, this will only be successful if the elements in the block are perfectly square ;-). Notice the area where the top green arrow is pointing — see how the hopping foot is snug against the edges of the slot? Sometimes, when you move the ruler to the next position, you can end up with it sitting on top of the hopping foot if you’re not watching carefully — if you stitched with it like that, you could damage your hopping foot, the needle, the timing of the machine, and/or the ruler! The final picture (below) shows how I’ve lined up the stitching line so that it will go exactly in the centre of the slot. I eyeball this, and with some practice have got pretty good at ‘guessing’ where that stitching line will go. Again, the green arrows show the visual cues I use to align those points with the centre of the slot, and the red arrow shows the vertical line parallel to the block. Rulers work best with the machine set to the ‘needle down’ position. If you have to make adjustments, you won’t have jumps in your stitches if you use ‘needle down’. You only need to make small adjustments to change direction. 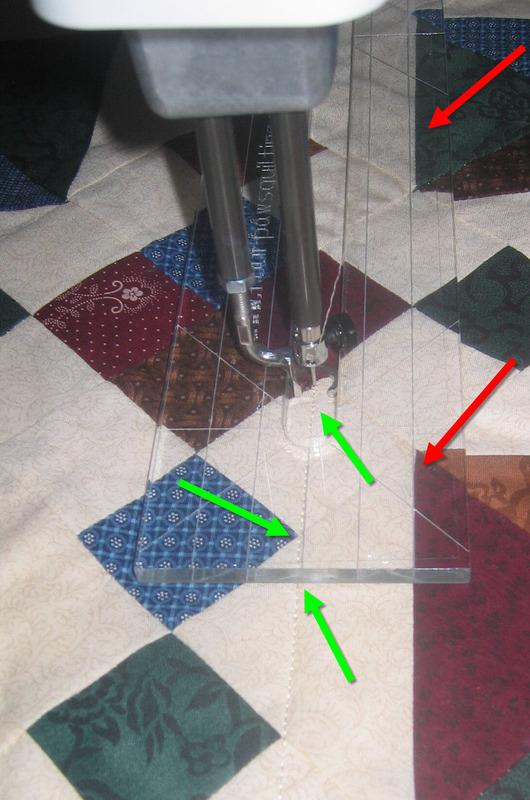 You need to apply downward and push/pull pressure to move the ruler and quilt under the needle. Make sure the hopping foot is snug in the slot before you start stitching. Use the laser-etched lines on the ruler as guidelines. You can line them up with seams, with other stitching lines (for an exact echo measurement), or with other elements on the quilt. When stitching long lines, you don’t need to stitch the full length of the slot before adjusting the ruler. Stitch as far as you’re comfortable with (this might only be 4 or 6 inches), then stop. Adjust the ruler and start stitching again. With practice, you’ll be able to guide the ruler a smidge with your fingers as you’re stitching, but initially stop, then start again. You WILL improve with practice! On my Sweet Sixteen, I can now stitch straight lines at 60-70% speed; when I first started using this ruler, I was going at about 15% speed. Thank you for the tutorial, I wondered if this ruler would work for the Sweet 16 and now I know! Thanks for the very clear tutorial. Do you have the overlay on your SS table? Yes, I do, and it certainly makes using this ruler MUCH easier. I had the ruler before I got the overlay and didn’t use it a lot as it rocked on the ‘hump’. The overlay took that hump away. I hope to start doing more ruler work now that that impediment has been removed. you don’t HAVE to use a ruler for straight stitching (like stitch-in-the-ditch), but it sure helps. There are various rulers (sometimes called ‘templates’) around for long-arm and mid-arm machines. The critical thing is that they are 1/4″ deep — any rulers you might use for cutting or on your domestic sewing machine are not suitable and will likely snap. I like the Line Tamer as it really helps keep your stitching straight. There’s a link in the first paragraph of this post to where you can buy it online (also here: http://www.fourpawsquilting.com/pages/template.html). Some quilt stores in the US also sell it, though I have no idea where. Rhonda where do you get the “clear grip” to attach to the underside of the ruler??? this is unclear………….. I no longer use Clear Grip. 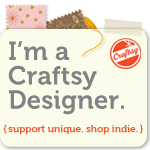 Instead I use Handi Grip from Handi Quilter, which is much better in my opinion. You get it from fourpawsquilting.com. I think the link is in the post. Thank you, I was hoping there may have been a distributor in Australia. I’ve never used the Simple (it’s only JUST been released and I Have no intention of getting one). I suggest you ask Handi Quilter this question. Rhonda, which thickness did you buy for the Sweet Sixteen the 9/16″ or the 1/2″?